Doon Chetin is a popular Kashmiri chutney made with walnuts (doon). Walnuts are ground into a paste along with green chiles and mint leaves. The paste is later mixed with yogurt for the doon chetin / walnut chutney. Makes: around 1 1/2 cups of Walnut Chutney. Remove stem, wash and roughly chop green chile. Wash and roughly chop mint leaves and cilantro leaves. First grind the ginger and green chiles into paste using a blender. Then add mint leaves, cilantro and walnuts. Grind into paste using enough water or yogurt and salt. Remove the ground walnut paste onto a bowl, stir in yogurt. Serve walnut chutney as a dip or with roti or with bread etc..
Notes: Make sure to adjust spice with green chiles. Suggestions: Use a pestle to first crush the walnuts and then mix with other ground ingredients for better texture. Variations: Dried mint can also be used in which case let the walnut chutney sit for couple of minutes for mint to rehydrate. Green chiles can be substituted for red chiles or red chili powder. Other Names: Doon Chetin, Kashmiri Walnut Chutney. Heat the sesame oil, add the crushed garlic cloves fry until they turns bit crispy, now add the white spring onions,saute for few seconds, add the chicken chunks, chilly flakes with soya sauce, oyster sauce..saute everything for few seconds in high flame until the chicken chunks get cooked..
Add the bean sprouts and saute for few seconds, makes a thin white sauce with cornstarch and water..add immediately to the cooking veggies until the sauce get thickens..finally add the white pepper powder, chopped green spring onions ,give a stir and enjoy along with rice or noodles.. I love to make simple rice or pulao with sprouted beans, recently i sprouted a packet of green moong beans, with these sprouted moong beans i prepared many dishes and finally some leftover beans were sitting in my fridge and i wanted to finish them quickly as something delicious, quick and easy...Finally i went for this simple pulao with simple ingredients and curd instead of using coconut milk or fresh grated coconut for making a grounded masala to prepare this pulao, u doesnt need anything special to make out this delicious and nutritious pulao as they go for quick preparation..Best way to sneak these protein packed whole moong beans and we enjoyed having with simple onion raita..Sending to CWS-Pepper guest hosted by Padma,event started by me also to Think Spice-Think Garam Masala guest hosted by Sarawathi, event by Sunita..U can store this beautiful and healthy sprouts pulao in a ziplock bag and freeze them, this pulao will stay intact for more than three weeks and get ready within few minutes if they warmed through microwave oven..Sending this dish to Preeti's Home Alone-Rescue Avi Gourmet Event..
Heat enough oil in a pressure cooker,fry the whole spices until they turns brown, meanwhile wash and soak the basmati rice for 5minutes..drain the excess of water, keep aside..now add the chopped onions, chopped tomatoes, ginger garlic paste, slit opened green chillies to the pressure cooker, saute until the onions turns transculent and the raw smell goes away, now add the sprouted moong beans along with salt, cook in simmer with lid closed for few minutes until they turns bit soft, add now the veggies along with pepper powder, cumin seed powder, fennel seed powder, red chilly powder, coriander powder, garam masala powder, saute everything until the veggies get half cooked...meanwhile heat few drops of oil, roast the soaked rice until they get a shiny texture.. Mix the yogurt with water, add them to the cooking veggies...bring everything to boil, add immediately the rice,stir everything, close the pressure cooker with the lid, put the weight..cook in simmer for 10minutes, put off the stove..Once the pressure get released, add the chopped mint leaves, toss gently and serve immediately.. Enjoy with any sort of raita eventhough my choice goes definitely for onion raita..
Dal Makhani literally means buttery lentils. I did my spring-cleaning and cleared almost all the clutter from every nook and corner of our home, before my parents arrived. However, some ingredients from the pantry were begging to be cleared off. One among those was a cup of black urad dal bottled up, may be for years now after sunnundalu preparation. Nupur's dal makhani seemed a nice way to use up that left over urad dal, to check one of the recipes from my 'bookmarked' folder and also to participate in this month's 'Blog bites - What's lurking in the kitchen'. Dal makhani, one of the delectable sidedishes from the Punjab region of India also happens to be one of my favorite ones. However, I usually reserve this rich and creamy dish to those occasions when I dine out. To watch oodles of butter and cream going into a dish while cooking, (however favorite that may be) would give me a heart attack. Keeping apart my reservations, those butter and cream lend the flavor and richness to the dish and protein packed dal makhani happens to be one of the popular and standard items on Indian restaurant menus, here in this country. 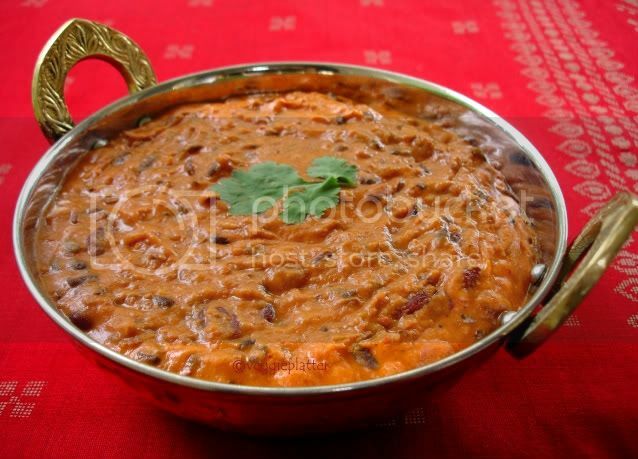 Preparing dal makhani is a simple task and even a novice cook can master it. Urad dal with the black husk (not the skinned* ones), rajma, chana / garbanzo beans are soaked and cooked till they attain a creamier texture. Also in go the spices, butter and cream resulting in a palate pleasing dal. This was a decent recipe that contained less amounts of butter & cream. Soak overnight (or as needed) the red kidney beans, black urad dal and chana dal. Throw away the soaked water and wash the legumes thoroughly. (Freeze the legumes, if using later.) Pressure cook them together and mash coarsely. Heat the oil and add the minced ginger. When it starts to brown, add cumin seeds, asafoetida and the fenugreek seeds. When cumin starts to splutter, add the tomato puree. Cook the mixture for about ten minutes or till the tomato appears cooked, stirring often. Add the cooked legumes and salt to the tomato mixture and bring to a boil. If it appears too thick, add a few Tbsp of water. Stir in red chilli powder, garam masala, heavy cream and 1 tbsp. butter. Simmer for 5-10 minutes and turn off the heat. Our dal makhani was served with rotis, along with onion slices and lemon wedges. Eggplant is roasted on direct flame till its charred. Then the roasted eggplant is mashed with spices and mixed with whisked yogurt. Finally the eggplant mixture is tempered with typical south Indian spices. Roasted eggplant is generally served steamed rice. Makes: around 3 Servings of Roasted Eggplant in Yogurt. Whisk yogurt well and keep aside. Apply oil to the eggplant and pierce it a couple of times with a knife or fork. Place the eggplant directly on the flame turning occasionally until the skin is completely charred on all sides. Remove stem and reserve the roasted eggplant. When mustard seeds start spluttering, remove the tempering from heat. In a bowl, add green chiles, cumin seeds and salt. Using a pestle, crush the ingredients well and add the roasted eggplant and turmeric. Mash the eggplant with crushed ingredients and remove onto a vessel. Add yogurt to the eggplant and mix thoroughly. Finally when tempering cools down a bit, add it to the yogurt bowl and stir. Adjust any seasonings if required and serve roasted eggplant in yogurt with steamed rice. Notes: Make sure eggplant is cooked well. 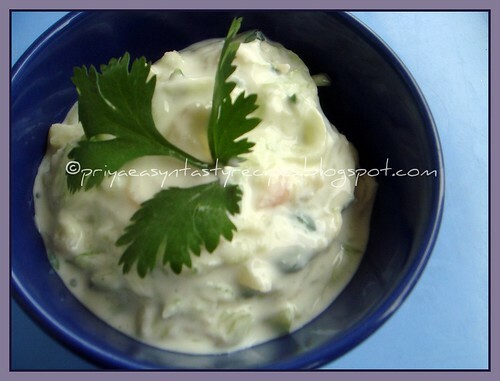 Variations: You can also add chopped cilantro to the yogurt. Other Names: Roasted Eggplant in Yogurt. 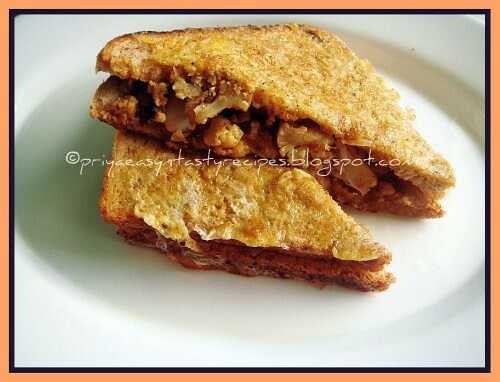 I was hosting this month Global kadai and i was bit late to post my entry for this fabulous event..finally am here with a fantastic bread toast i prepared with pepper gobi masala which i finally prepared as toast with peppered beatened egg...This bread toast suits prefectly for lunch with a simple salad while for dinner with a bowl of soup..Its quite a filling toast, tastes awesome and spicy coz of the gobi masala i have prepared with pepper powder and garam masala powder..Its also a quite a simple masala which i usually prepare along with green peas and potatoes,but this time i totally went for gobis as they were sitting in my fridge since for two days..Needless to say that this spicy indianized version of this bread toast goes to Global Kadai-Indianized French Toast hosted by me, event by Cilantro..
Heat enough oil, fry the fennel seeds and add immediately the chopped onions, chopped tomatoes, ginger garlic paste with enough salt ,saute until the onions turns transculent and the raw smell of ginger garlic paste get disappears..now add the chopped cauliflower florets, saute for few minutes..finally add the pepper powder, garam masala powder, toss everything gently, put the flame in simmer and cook until the veggies get well cooked,finally add the chopped mint leaves, put off the stove.. Fill two bread slices with enough pepper gobi masala, cover the masala with the another two bread slices, meanwhile beat the egg,milk with pepper powder and salt.... heat enough oil in a pan..dip gently the stuffed masala bread slices in the egg mixture and drop immediately to the pan, cook on both sides until they get golden brown..
Chocolate, the word itself makes me drool, who will say 'No' to chocolates??? definitely not me that too during special occasions, this weekend was something special for me and i was very much happy to prepare this chocolate fondant cake to celebrate that special day..This fondant cake is one of our family favourite and i do this often for special occasions, eventhough i never ever posted this cake recipe in my space yet, so when i prepared this cake for the special day, i tried to present them with a nutella cream frosting which i tried for the first time at home, i did the frosting very much easily with nutella spread, butter, confectioner's sugar, but the difficult part is to decorate the cake, am not a professional nor took a special baking or cake decorating class till now, its was kinda a hard task for me to decorate a cake, somehow i managed to decorate this chocolate fondant cake, u can also notice that i didnt decorated them prefectly, eventhough everyone at home liked the way i have decorated the cake and enjoyed having them...Sending this cake to Champa's Bake Off Event..
Preheat the oven to 350F..Beat the butter and sugar until they turns soft and smooth, meanwhile separate the egg yolks, beat the yellow yolks along with the butter-sugar mixture until they turns pale..In a microwave safe bowl, add the chocolate pieces with few water and melt them for few minutes, add this melted chocolate to the already prepared butter,sugar and egg mixture...Give a stir, now add the flour, its will be very thick to mix,dont worry, stir them well and keep them aside...Beat the egg whites with a pinch of salt until they turns foamy, beat until the soft peeks form..now fold this beatened whites to the chocolate-flour mixture, little by little until they get well mixed..
Pour this cake batter in a greased round pan, bake for 20-25minutes or until a skewer inserted cames out clean..Keep aside and the cake get cooled completely..
Take all the ingredients in a bowl and beat until everything get well mixed...fill this cream in a ziplock bag, make a small hole, press this cream over the already prepared cake, using a spatula spread the frosting over the cake and with the remaining cream,decorate the cake as u desire, i springled few chocolate vermicelli over the cake..Keep them in fridge for two hours and serve them.. 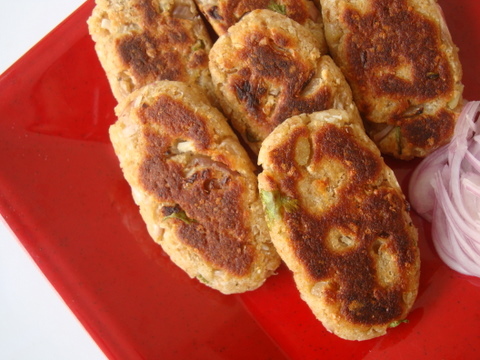 Vegetable cutlets are kitschy stalwarts of India's wonderful railway cafeterias. 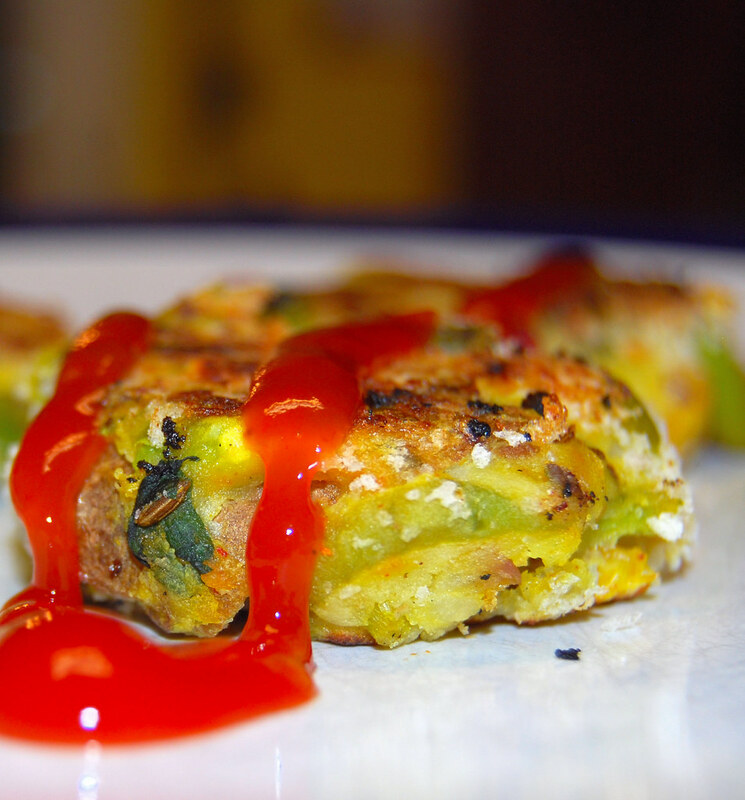 I remember them as flat patties, usually in the shape of a teardrop or round, with specks of sooji or rava or farina. They were usually served up with ketchup and didn't taste of any particular vegetable. Heck, they didn't even taste particularly good. And they tasted the same no matter where you were in the country. I have been on a mission to reduce the amount of sweets cooked in my kitchen and that means coming up with recipes to satisfy the snack-seeking Desi when we get home from work late in the afternoon. It's either that or gobs of peanut butter and jelly on toast. Since that latter option doesn't appeal to me as it does to him, I try when I can to come up with something different. These vegetable cutlets are a great option because their lusciousness owes itself to the great spud and not fat. I've said this before and I'll repeat it-- potatoes are one of the best veggies around, and they appeal to almost anyone, child or adult. What usually gives potatoes a bad rep is the way they are prepared-- deep-fried, or topped with tons of unhealthy cheese or sour cream. But find a healthy way to cook it, and you can have your potato and eat it too. I've no time to chat today, so I'll leave you with the recipe for these cutlets. They're easy and they taste better than any vegetable cutlet I ever ate at a railway cafeteria. They're also versatile-- you could add to these grated carrots, green peppers...use your imagination. The best part-- like I told Desi, it's like eating your veggies for a snack. 3 medium russet potatoes, boiled and mashed. Leave their jackets on-- potatoes hide most of their best nutrition right under the skin, so it's never a good idea to peel them. Make sure, though, that the potato skins are in small bits. 1/2 cup of bread crumbs (I used panko -- Japanese bread crumbs that crisp up really well). Place in a plate for dredging the cutlets. Heat oil in a skillet. Add the cumin seeds, and, once they sputter, add the onions and garlic. Add the chilli and turmeric powders, stir into the oil, then add the peas and green beans. Cook for another two or three minutes until they are quite tender. Add the mashed potatoes and stir well together. Add salt to taste, and lemon juice. Turn off the heat and stir in the coriander leaves. Set aside so the potatoes are cool enough to handle. Spray on a film of oil. Take a 1-inch ball of the potato mixture and flatten it into a disc. Dredge it through the panko crumbs so you have a fairly even coating on both sides. Add the active dry yeast, sugar and salt to the luke warm milk and let this mixture sit for 5 minutes,until the yeast turns foamy..Now add the softened butter, confectioner's sugar,beatened egg,bread flour,almond powder,almond extract and the foamy yeast mixture ,water (if needed) and knead as a soft and smooth dough, arrange this dough in a greased bowl and keep this bowl in a warm place for an hour with lid closed until the dough doubled their volume..
After an hour, make 10-12 medium sized balls, knead well until the dough turn soft, shape them as buns..Arrange them over a baking sheet lined over a baking tray..let them sit again for an hour or until they doubled their volume...Preheat the oven to 350F..meanwhile brush the buns with egg yolk mixed with water, springle the almond flakes and bake them in middle rack of the oven for 25-30minutes until the crust turns golden brown..
My second post which i tried and tasted from Divya's blog is this Garbanzo Fritters, while i was searching something as snacks with chickpeas at her blog,i got this crispy fritters and this fritters are very much similar to the famous chickpeas fritters called falafel, Divya prepared them in Indianized way with our Indian spices and its really very quick, easy, crispy, delicious snacks which get ready in less minutes, tastes marvellous when served along with ketchup or any other spicy chutney for evening snacks..Thanks to Divya for sharing this simple but yet a delicious snacks or appetiziers which can also be a crowd pleaser..U can either use dry chickpeas which can be soaked overnite and pressure cooked or either canned chickpeas to prepare this fritters, i went for the tinned one and its really very easy and quick to prepare this fritters..This fritters goes directly to T&T Dil Se.. guest hosted by Champa, event by Zlamushka & Lakshmi.. Drain the tinned chickpeas in a strainer, combine the chopped onions, garlic, salt, coriander powder, cumin powder and blend it as coarse paste, add the flour, coriander leaves, mix everything well, make small balls from this mixture, meanwhile heat the oil for deep frying, drop gently the already prepared balls, fry them on both sides until they turns golden brown.. Enjoy for snacks with ketchup..
Taro root / arbi is pressure cooked till soft and then peeled and sliced. 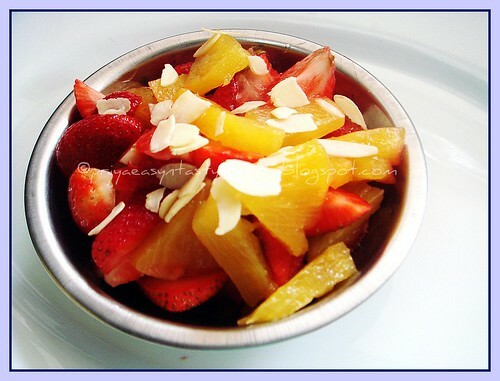 A sweet and sour mixture is prepared with onion, jaggery and tamarind. Sliced arbi is finally cooked with the mixture until the curry comes together. 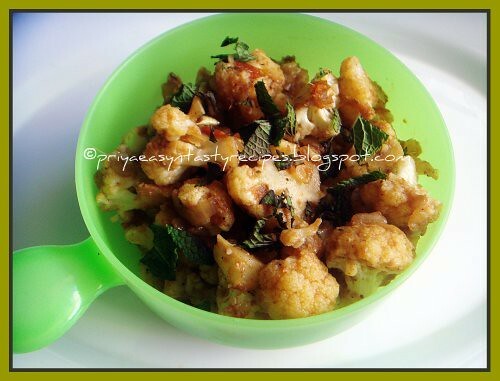 Serve sweet arbi curry with steamed rice or with roti. Makes: around 4 Servings of Sweet Arbi Curry. Soak tamarind in half a cup of warm water for sometime and extract all the thick juice discarding the strings. Wash and add water to the arbi until it just soaks. Pressure cook arbi for 3 – 4 whistles. Cool arbi down to room temperature and peel the skin off. Chop arbi into thick circles and keep aside. 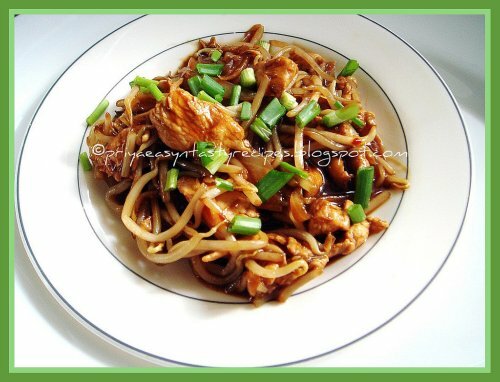 Heat a tsp of oil in a pan, add all talimpu ingredients in order. When urad dal changes color, add chopped onion, green chiles and salt. When onion turns translucent, add tamarind extract, jaggery and turmeric powder. Then stir in cooked arbi and stir. Slightly mash few of the arbi pieces and let the curry come together. 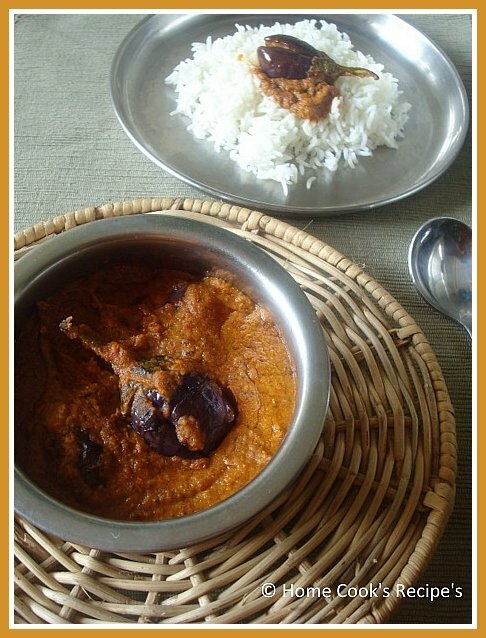 Serve sweet arbi curry with steamed rice. Notes: Make sure to cook arbi well. Suggestions: Adjust the sweet and sour notes of the curry with jaggery and tamarind. Variations: Check out the Taro / Arbi tag for more variations with the taro root / arbi. Other Names:Sweet Arbi Curry, Chama Dumpa Teepi Kura, Taro Root Curry. Yesterday, we had Rajma Chawal and Pineapple Mint salad for lunch. I kept aside some cooked rajma (kidney beans) to prepare a salad. Today, I made a Mexican inspired kidney bean filling for sandwich. Lovely flavors and made for a filling meal with watermelon smoothie on a hot summer day. 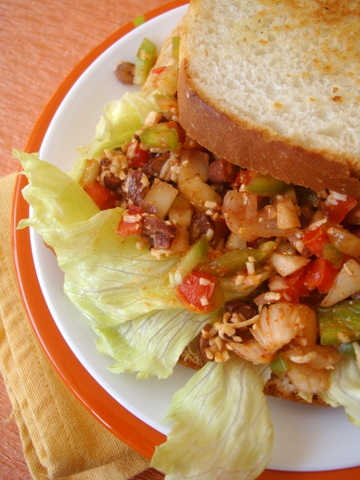 Toast whole wheat or brown bread on one side, spread some mayonnaise or tomato sauce, place lettuce leaf and spoon some of the kidney bean filling all over. Place a toasted bread slice over it and serve. Vermicelli or semya is used here for making dosa. This is instant dosa where you need not soak any of the ingredients before using. Vermicelli is mixing with rice flour and sooji for binding. A batter is prepared by mixing it with yogurt and making lightly crisp and brown vermicelli dosa. Makes: around 6 Vermicelli Dosa. Grind green chiles and ginger into coarse paste. In a mixing bowl, add vermicelli, sooji, rice flour, yogurt, green chile ginger paste, cumin seeds, cilantro and salt. Add around one cup of water and make it into a batter. Heat a flat pan on medium heat, apply quarter tsp of oil with back of a spoon. When pan gets hot, pour a big ladle full of vermicelli dosa batter on to the pan in circular motion. Make sure batter is thin enough that it spreads by itself into around 6 – 8 inch diameter dosa. Spread the dosa a little with back of a spoon if there are any blobs of batter. Cook covered on low flame for about a minute for vermicelli to cook from inside. Uncover and fry till bottom side starts to turn light golden brown. Pour 1/8th tsp of oil on semya dosa and carefully turn on other side. Reduce the heat to medium and cook on this side for about a minute before removing from heat. Turn again and fry for couple of seconds to crisp up the dosa. Repeat the same with remaining vermicelli dosa batter. Serve vermicelli dosa immediately with sambar or with any chutney of your choice. Notes: Make sure to get the consistency of the batter right. 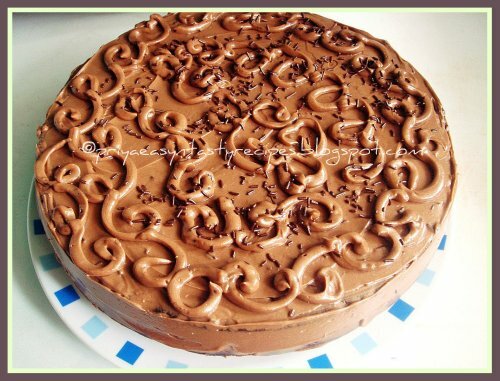 Suggestions: If the batter is too thin, it spreads easily but sticks to the pan and doesn’t come out. If the batter is too thick, it doesn’t spread much but comes out as thick dosa. Adjust the consistency with water accordingly. Variations: You can also use regular vermicelli and roast it until light golden in color if desired. Other Names: Vermicelli Dosa, Semya Dosa, Semiya Dosalu. We had a long weekend this week and i was quite lazy to prepare our dinner, finally i went for something easy, healthy at the same time a guilt free dosa to enjoy with a spicy chutney...I soaked wheat rava,oats along with brown rice, grounded together and prepared as dosa immediately, this dosa batter doesnt need go for fermentation..This wheat rava and brown rice dosa suits prefectly for diabetic patients and with any side dish, this dosa awesome both for breakfast and dinner..Everyone at home enjoyed this dosa with spicy coconut chutney, i prepared this dosa in a nonstick pan, thats how i avoid the addition of oil for making out these dosas and am preparing this dosa often nowadays, as its need just the soaking and grinding time else its a simple and easy breezy dish..
Heat the nonstick pan, pour a ladle of this batter, spread them as a dosa.. cook on both sides until they get cooked..Serve hot with any spicy chutney.. I cant stop using stale bread in my cooking nowadays, before i usually prepare home made bread crumbs by grilling them and grinding them as bread crumbs, i have a huge bottle of bread crumbs now and i dont want to make out more bread crumbs for few months, so i have found some alternative dishes where i can use those stale bread instead of throwing, one among those dish is this palak bread kofta curry...I prepared this bread kofta with stale bread slices along with potatoes also instead of deep frying, i prepared them in paniyaram pan, which needs few drops of oil and finally cooked everything in a spinach gravy spiced with ginger garlic paste, onion,spinach & tomato puree with spice powders, we enjoyed having this kofta curry with our rotis for dinner and we just loved it, this green kofta curry tastes fabulous, healthy as well as prefect for also aged people..
Heat few drops of oil, saute the chopped onions with salt, cook until the onions turns transculent, take the bread slices, potatoes, sauteed onions, chopped green chillies and chopped mint leaves in a bowl, mix everything, meanwhile heat the paniyaram pan, heat few drops of oil, take a small ball from the mixture, roll it a bit as round balls and drop gently to the paniyaram pan, cook on both sided until they get well fried..Continue the process until the mixture gets finished..Keep aside the bread koftas..
Cook the cleaned and chopped spinach leaves with half a cup of water in microwave oven for 5 minutes in high..meanwhile heat few drops of oil, saute the onions and tomato pieces and cook until they get well cooked..Let them cool and grind the cooked spinach leaves and sauteed veggies together until they turns as a smooth paste. Heat enough oil, let crack the cumin seeds, add the ginger garlic paste, saute until the raw smell goes off, add the grounded paste along with enough water,coriander powder, cumin seed powder and red chilly powder with enough salt, cook in simmer for few minutes, finally add the already prepared bread koftas to the spinach gravy and cook again for few minutes..put off the stove.. This is one of my most most favourite kulambu from my mom's kitchen. 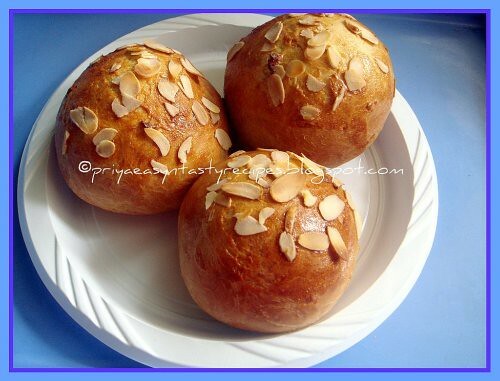 We used to call a Cook to prepare special sweets like Jangri, Laddu etc. for festivals. The Cook Prepares excellent Ennai Kathirikaai Kulambu. Whenever the cook comes to our home, i used to whisper at my mom's ears, to prepare this kulambu. and whenever my mom comes to my college hostel, she brings a big dubba of this kulambu, which we will finish of in a single meal. 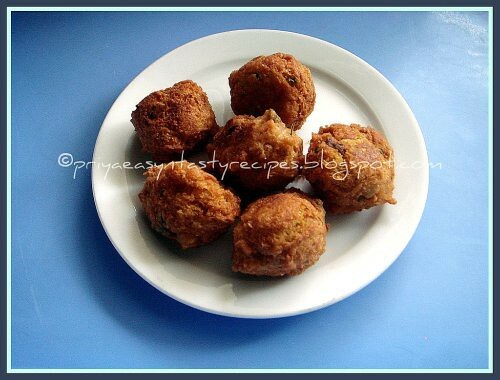 so this is the best ennai kathrikaai kulambu recipe, which i try atleast once in a week. Tamarind - a small lemon size. Dry Roast the above ingredients and grind into a coarse powder. to the grounded coarse powder, add the following and grind into a smooth paste. Now the Masala is Ready. Make a X cut on Brinjal's. check inside whether its clean (without sothaai). 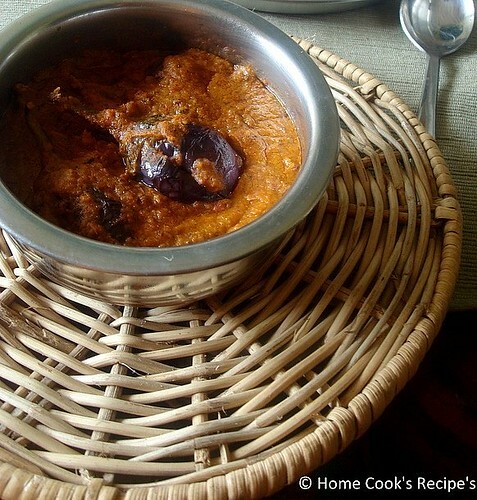 Fill some masala's into the "X" cut of brinjal's and let the brinjals marinate in masala for about 10-15 minutes. Soak the Tamarind in a 1/4 cup of warm water for about 10 minutes. squeeze the tamarind and throw out the pulp. Heat Oil in a Kadaai / Thick bottomed Pan. drop the brinjals stuffed with masala's one by one into the Oil. Let the Brinjal's get cooked in medium flame. when the Brinjals shrink and fried for about 4 minutes in medium flame, add the Masala's to the Oil and fry the masala in the oil for 2 minutes. Add Tamarind water to the Pan and let the kulambu boil. slow the flame. add salt to taste and mix well. Now reduce the flame and close the pan with its lid and let the kulambu sit on the flame for about 15 minutes or till the brinjals get cooked fully and till Oil comes on the sides of the Pan. Add some Curry leaves and remove from the flame. The Kulambu will be in a thick paste form. it will be so divine to mix with Hot Rice. 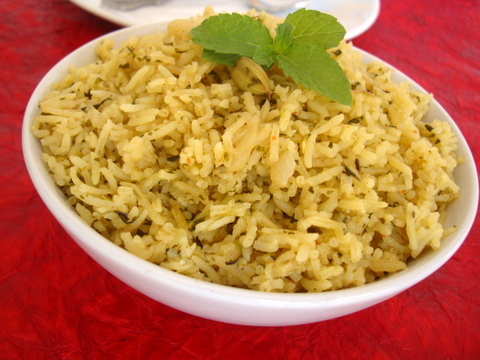 Light, aromatic and immensely flavorful rice dish that calls for handful of ingredients. The mint flavor is subtly infused in the rice without being overpowering. Tinted with a light green shade, smelling of warmth and sunshine, pudina pulao makes for an endearing meal to serve family and friends. 1 Heat oil+ghee in a cooking vessel, add whole spices, shahjeera and bay leaf and saute for a few seconds. Add the sliced onions and saute for 4 mts. Add the ginger garlic paste and pudina-green chillis paste and saute further for another 6 mts. Add red chilli pwd and combine. 2 Add the washed rice and saute for a minute. Add 3 3/4 cups water and bring to a boil. Reduce heat and cover with lid and cook till the rice is done. Horse gram rasam / ulava charu is a popular rasam made with horse gram. Horse gram is soaked in water overnight. It is then boiled in water for a very long period of time along with spices for a thick rasam consistency. Ulava charu is quite famous around Vijayawada in Krishna District, Andhra. Makes: around 1 1/4 Cups of Ulava Charu. Soak horse gram in water overnight. Refresh the soaked horse gram with fresh water. Soak tamarind in warm water and extract all thick juice. Bring to boil around 4 cups of water, add soaked horse gram. Boil till horse gram is soft but not mushy (around 1 hour). Alternatively, pressure cook the soaked horse gram in around 4 cups of water for 4 – 5 whistles. Strain the cooked horse gram to collect all horse gram and reserve the cooking liquid. Take around half of the cooked horse gram and grind it into fine paste adding enough cooking liquid. Heat the reserved cooking liquid on medium heat and boil for around 15 minutes. Stir in ground horse gram paste to the cooking liquid. Put the mixed mixture on medium heat, add tamarind extract, green chiles, red chile powder and salt. Cook till the liquid reduces to thick pourable consistency. Heat oil in a pan, add mustard seeds, cumin seeds and curry leaves. When mustard seeds start spluttering, remove from heat and add to above horse gram rasam. Serve horse gram rasam / ulava charu with plain steamed rice and dollop of ghee. Notes: Make sure to cook the horse gram for a good amount of time. Suggestions: If the rasam is not thick enough, boil the horse gram rasam till preferred consistency. Variations: For a more traditional recipe, keep cooking the horse gram till the liquid reduces to a thick liquid. You can also add small onions and tomatoes to the boiling horse gram rasam for a variation. Temper with chopped ginger and garlic. Garnish with chopped cilantro and a dab of butter. Other Names: Horse Gram Rasam, Ulava Charu. 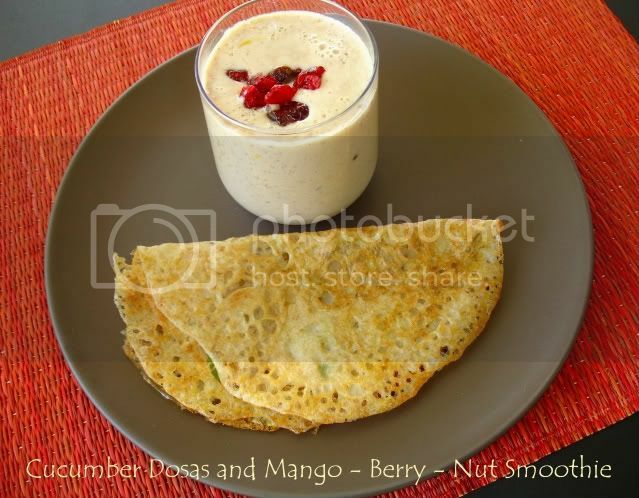 This Sunday's wholesome lunch was cumin - ginger flavored spicy cucumber dosas with a rich, mango - berry - nut smoothie. 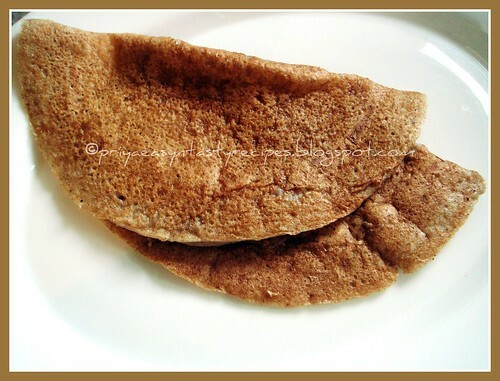 Southekayi rottis were the inspiration for these dosas. The following ingredients are just to give an idea. The proportion of flours, vegetable and the flavors in the following recipe can be changed according to one's taste. * Grind ginger and chilies into a paste, if serving kids. Or finely mince chilies and grate the ginger piece. * Mix the flours, cucumber, cumin seeds, asafoetida powder, salt, green chili - ginger paste, cilantro in a bowl. Add water and form a thin, lump free batter as you do for rava dosa or godhuma dosa. * Heat a griddle or a shallow pan. Sprinkle a few drops of water on the hot pan to test whether the griddle is ready. If the water sizzles, it is. Take a ladle full of batter and pour it from a little height on to the griddle. Start pouring the batter from outside circle of the griddle. The batter is sticky and so spreading it with the back of the ladle as traditional dosas should be avoided. It will spread on it's own and fill any gaps in the middle with dosa batter. Pour about half a tsp of oil around the edges of dosa and let it cook on medium flame. When the dosa turns browner (the side closer to the griddle), flip it and again pour another 1/2 tsp oil around the edges and let it cook for a minute and remove it. 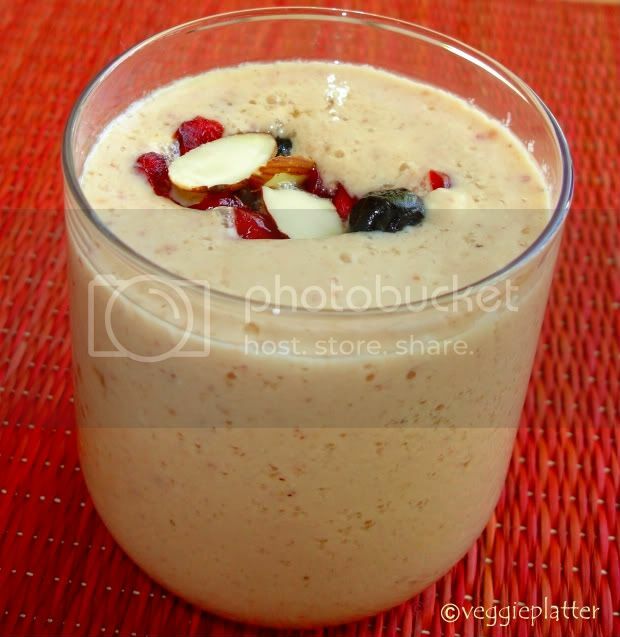 Mix everything and process in a blender for a rich, yummy smoothie. Add ice cubes if serving on a hot day. Garnish with nuts and some dried berries if you wish. Cucumber dosas go to Priya's Cooking with Seeds - Cumin seeds hosted @ Sara's Corner this month. Divya's 'Show me your Smoothie' and Niloufer's Twenty - 20 cooking event. Alu chaat is quick and easy chaat made with boiled potato. 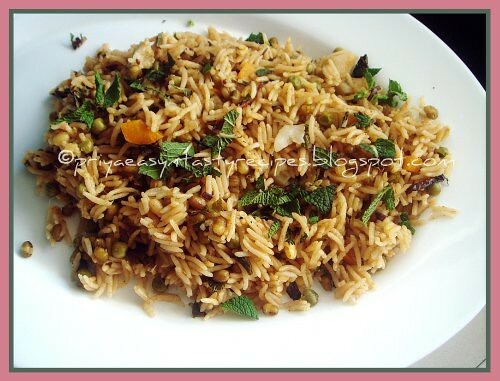 Poha mixture is layered on the sliced potato along with spicy onion mixture. Makes: around 3 Servings of Potato Chaat. Grind red chile, cinnamon, clove, coriander seeds into fine powder using a spice blender. Bring to boil few cups of water, add baby potatoes and salt. Boil till potatoes are just soft and remove from heat. Cool them to room temperature and peel the potatoes. Slice the potatoes into thick slices. Mix masala powder and salt and rub on each side of the potato slice. Mix together chopped onion, roasted peanuts, red chile powder, salt, cilantro. Heat a flat pan on medium heat, add poha. Fry till poha is crisp. Make sure poha doesn’t change color. Remove from heat, add oil in the same pan while its still hot, add red chile powder and salt. Immediately add the poha to the oil and toss well to coat the poha with red chile powder. On a serving plate, arrange the potato slices. 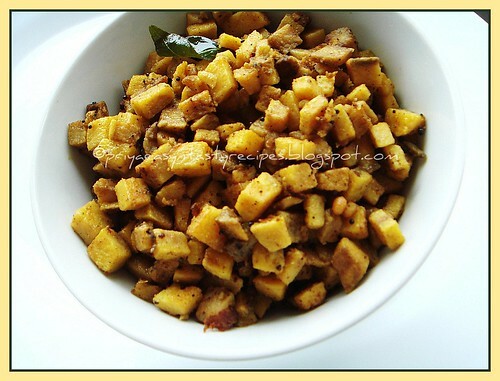 Layer each potato slice with poha mixture. And then just before serving, layer with onion mixture and lemon juice. Notes: Make sure potatoes are not overcooked. Suggestions: Adjust the spice with red chile powder. Add chopped green chiles for more spice. Variations: Check out the previously posted recipes of various chaat here. Other Names: Potato Chaat, Alu Chaat, Aloo Chaat. White sesame seeds are toasted along with other spices and red chiles. Everything is ground into fine powder for spicy sesame seeds powder. Sesame seeds powder can be mixed with steamed rice and dollop of ghee. 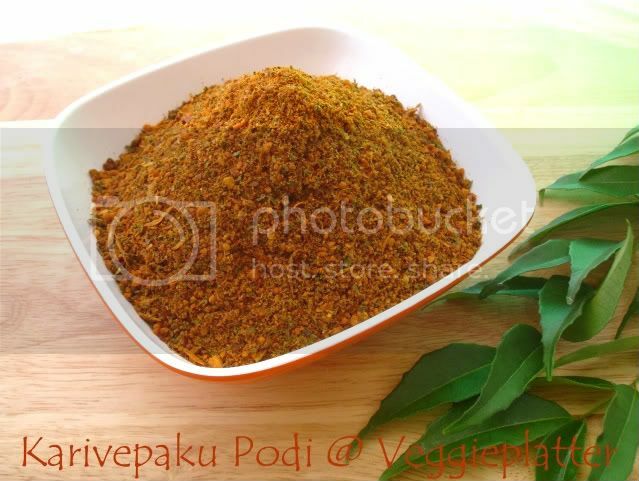 Makes: around 1 1/2 Cups of Nuvvula Podi. Heat oil in a pan on medium – low heat, add red chiles and fry till they change color and remove onto plate. Add chana dal and fry for couple of seconds, add urad dal and fry till they both change color. Remove from heat and add another tsp of oil. Add coriander seeds, cumin seeds and fry for couple of seconds. 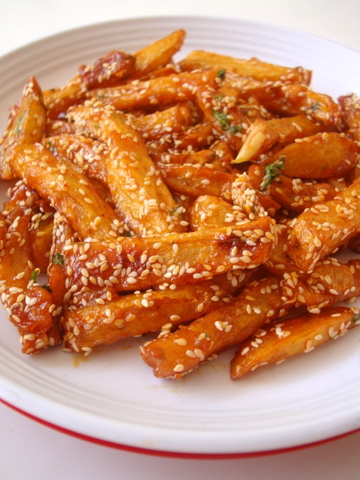 Then stir in sesame seeds and fry till they change color. Cool everything to room temperature. Firstly add red chiles and grind them into fine powder followed by chana dal and urad dal. Store the powder tight in a jar and it stays fresh for couple of weeks. Serve spicy sesame seeds powder with idly, dosa, steamed rice and ghee etc. Notes: Make sure not to burn any of the ingredients. Suggestions: Adjust the red chiles for spice preference. Variations: You can also add tamarind while grinding the other spices. Other Names: Spicy Sesame Seeds Powder, Nuvvula Podi, Til Powder. With 4 slices of left over bread and boiled potatoes (prepared Aloo parathas yesterday), I prepared quick bread cutlets for our evening tea time snack. Not much of a recipe really, used left overs that I combined with spices, chopped onions and fresh coriander leaves and shallow fried till golden crisp. 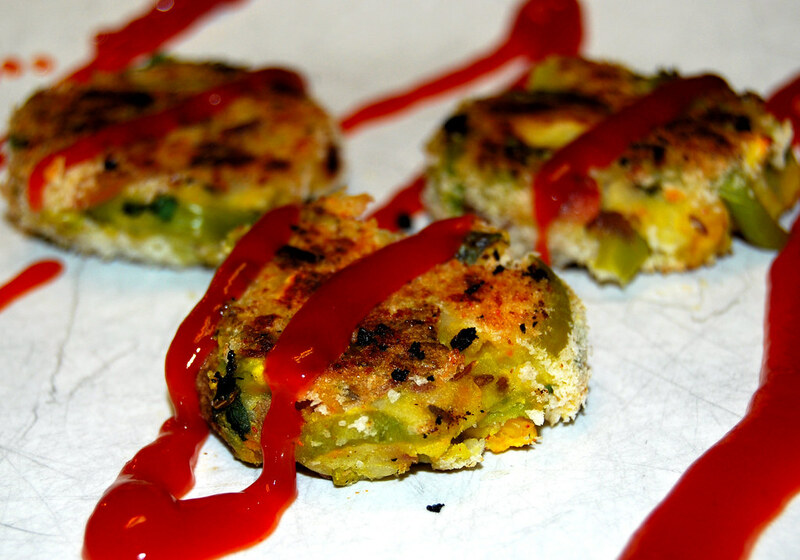 Fun, fast, healthy and tasty alternate to deep fried snacks. For variation you can add some chopped spinach or mashed green peas or grated carrot. Combine 4 slices of crushed bread (soak in a tbsp of yogurt for 2 mts), a mashed large potato, a finely chopped onion, chopped coriander leaves, 1/2 tsp kasuri methi, 1 tsp ginger-green chilli paste, 1/4 tsp coriander pwd, pinch of amchur pwd, 1 tbsp roasted peanut pwd, 1/2 tbsp corn flour, 1 tbsp grated cheese and salt to taste. Mix well. Shape into cutlets. 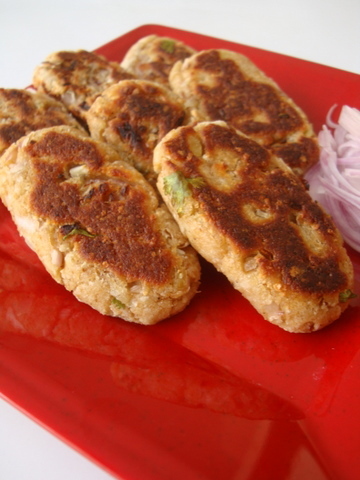 Drizzle some oil on a hot tava, place the cutlets on the tava and shallow fry on both sides till golden brown. Serve with tomato ketchup. Away from the monotony, I prepared an Awadhi style Moong dal to go with rotis. I used yellow moong that is lightly dry roasted before cooking and tempered with caramelized onions and mint leaves. I found the original recipe to be bland to my palate hence tweaked it to add some spice. 1 Dry roast moong dal for 3 mts. Wash the dal and pressure cook with 2 cups of water, ginger-green chilli paste and chopped onions, till soft. 2 After pressure is off, remove lid. Mash the dal lightly and add tomato puree and cook for 5 mts. At this stage I added cumin pwd, red chilli pwd and garam masala pwd (not part of the original recipe though). Add malai and combine well and cook for another 3 mts. 3 Heat ghee in a vessel, add mint leaves and saute till crisp. Remove and in the same ghee, add sliced onions and saute till transparent. 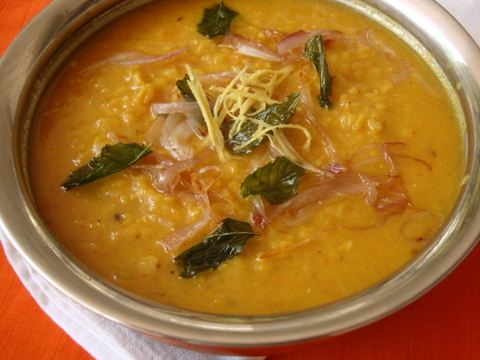 Add mint leaves and sliced onions to the dal and combine. Serve warm with rice or roits. Spring onion is called leeli dungLi in Gujarati. (dungLi means onion; leeli is green). I found some fresh green/spring onions at our local farmers market. So decided to make my MIL's thepla. 1. Mix all the dry ingredients. Stir in spring onions. Adding water as needed, knead a dough. 2. Add 1 tsp oil. Cover and keep aside for 30 minutes. 3. Make uniform balls. Roll into thin theplas. 4. Roast on hot tawa/pan till brown spots appear on both the sides. Use oil as needed for roasting/frying. 5. Save in a clean cotton towel till ready to use. 6. Serve along with chhundo (grated sweet n' spicy raw mango pickle). 1. for an extra kick, you can add minced green chilies if you like. Onion tomato gravy is prepared by cooking them in tempered oil along with spices and spice powders. Arbi / Taro root is pressure cooked and peeled. The sliced arbi is then cooked in the tomato onion gravy until done. Makes: around 4 Servings of Arbi Masala. Peel, remove ends and finely chop the onion. Wash and finely chop the tomatoes. Heat oil in a pan on medium high heat, add cumin seeds, cinnamon, clove, bay leaf and asafoetida. When cumin seeds start to brown, add chopped onion. Fry the onion till it turns light brown around the edges. Then add ginger garlic paste and green chiles and fry for few more seconds. Stir in chopped tomatoes and cook till tomatoes soften and become mushy. Then add coriander powder, red chilli powder, turmeric powder and salt. Fry till the tomato onion mixture comes together. Add sliced arbi, garam masala and a cup of water. Boil till the mixture thickens (around 5 minutes). Finally stir in fresh coconut, cilantro and remove from heat. 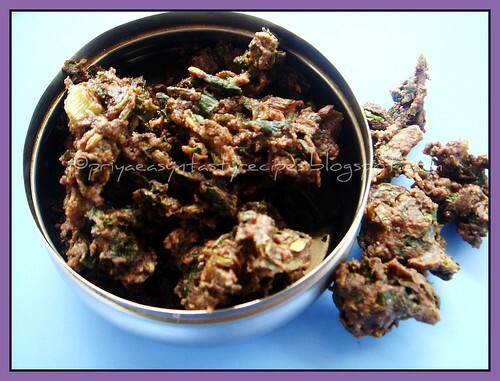 Serve arbi masala with roti or with steamed rice. Suggestions: If the gravy is not thick enough, put it back on heat and cook till it thickens. Add more water to dilute the arbi masala gravy. Variations: You can also add a tbsp of yogurt once you remove arbi masala from heat. Other Names: Arbi Masala, Taro Masala. Most of the South Indian backyards are adorned with a curry leaf tree since the curry leaves happen to be vital to the local cooking. There is absolutely no substitute to these highly aromatic leaves and no other ingredient in any kitchen can impart that much flavor to a dish and make it extra special. The leaves are appetizing and said to have digestive properties. These flavorful, fragrant leaves are combined with spices and dals to prepare this delicious karivepaku podi. Elders in our household believe that a meal started with karivepaku podi - rice combo is good for minor stomach ailments, especially in the case of little kids. In Telugu, curry leaves are called karivepaku which literally means black neem leaves. Heat oil in a sauté pan and add chanadal and uraddal to it. Sauté them on low flame. When they start to turn reddish, add coriander seeds, fenugreek seeds, pepper and chilies in that order and toast them as well. Finally add curry leaves and toast them till they turn crisp. Turn off the stove and add tamarind to it. Cool the mixture. Coarsely grind it adding salt in a blender and store it in an airtight container. Serve this podi with hot steamed rice and a spoon of ghee for a heavenly experience. Note: If preparing in small quantity, lemon juice can be substituted for tamarind. However, it doesn't have a longer shelf life. Lush green chickpea leaves was the first harvest from my kitchen garden this year. I made thepla from the first batch. 1. Rinse chickpea greens. Let them dry. Take off the tiny leaves. Set aside. I do not chop them as they are quite tiny & tender. 2. Mix all the dry ingredients. Stir in chickpea leaves. Using water as needed, knead the dough. Add 1 tsp oil. Knead again. Cover and set aside for 30 minutes. 3. Make 9 uniform balls. Roll into thin flatbreads. 4. Roast on a hot tawa or griddle till brown spots appear on both sides. 5. Store in a container covered with a clean kitchen napkin till ready to use. 1. You can chop the leaves if you like. I completely missed out blogging the garlic flavored sun dried tomato pickle recipe that I had promised my dear readers. Better late than never. 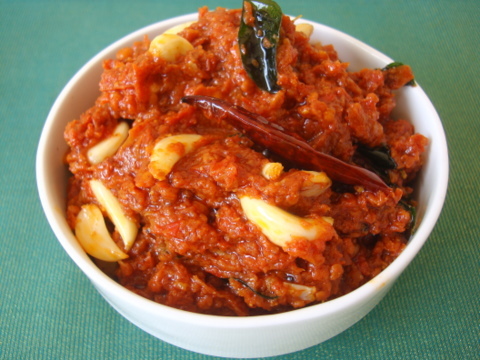 Today’s recipe differs from the earlier blogged Endu Tomato Pachadi in terms of the seasoning. Asafoetida aka hing is replaced with crushed garlic, mustard seeds and fresh curry leaves that are tempered in hot oil before combining with the tomatoes. This lends depth of flavor and strikes a balance between the acidity and fruity sweetness of sun dried tomatoes. 1 Slice each tomato into 6 pieces. Add salt and turmeric pwd, combine and place lid. Leave aside overnight. 2 Next morning, squeeze out entire liquid from each piece and spread the tomato pieces over a cloth and sun dry. Sun dry the pieces till they are completely dry with no trace of rawness. This usually takes 3-4 days of good sunshine. Every evening, remove the cloth containing the tomato pieces, place indoors and next day again place back the cloth containing the tomato pieces to sun dry. 3 Pour the liquid in a very wide (shallow) vessel. Add tamarind and allow to sun dry. This could take at least 4 days of good sunshine. The liquid will thicken. Every evening, remove the tomato liquid and place indoors, place back again the next day morning to sun dry. 4 Once the tomatoes and liquid are sun-dried, combine the dried tomatoes pieces with the sun dried liquid and leave overnight, covered. 5 Next morning, blend this to a slightly coarse paste. Add red chilli pwd, methi pwd, roasted mustard pwd and combine. 6 Heat oil in a vessel. It should not be too hot. Once hot, add mustard seeds and allow to splutter. Add the methi seeds, red chilies and fresh curry leaves and allow too saute for 15-20 secs on medium flame till the methi turns red. Do not burn it. Turn off flame and add the crushed garlic. Allow the seasoning to cool before combining with the tomato mixture. 7 Cool and store in an airtight bottle. Refrigerate. 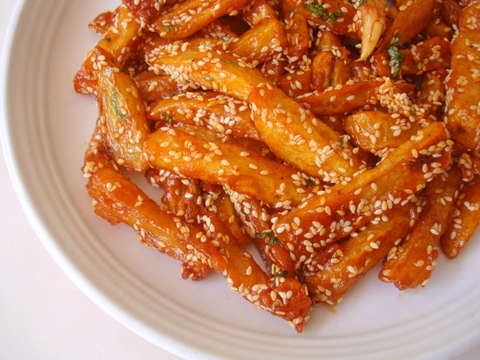 Popular Indo-Chinese recipe, Honey Chili Potatoes, owes it flavor to honey and fiery red chilies. I like the deep fried restaurant version but I prefer the healthy home made method where the potatoes are baked before being tossed in a sweet and hot sauce and sprinkled with toasted sesame seeds. Very flavorful and looks appealing in the serving plate. 1 Combine potato fingers, oil, red chilli pwd, tomato sauce, crushed garlic and salt and place in a ziplock bag and shake well. Grease a baking tray and spread the potato fingers on the tray and bake at 200 degrees C for 35-40 mts. You need to turn the potato fingers once during the baking process. OR you can deep fry the potato fingers to a golden brown shade. If deep frying add a tbsp of cornflour instead of oil to the potatoes and then deep fry. Remove onto absorbent paper and keep aside. Bitter gourd is grated, salted and left aside to remove the bitter juices. Bitter gourd is then fried till golden brown. Onion and tomato is cooked and ground into paste along with a spice mixture. Finally bitter gourd is mixed with the onion tomato paste and the chutney is tempered. Makes: around 2 Cups of Bitter Gourd Chutney. Wash, remove ends, lightly scrape and grate the bitter gourds on thick side of the grater. Alternatively, use a food processor to grate the bitter gourds. Mix in around a tsp of salt with grated bitter and keep aside for half an hour. Wash the salted bitter gourd under running water and then thoroughly squeeze off the water from the salted bitter gourd. Repeat the washing and squeezing process for couple of times to make sure most of the bitterness is gone. Heat a tsp of oil in a pan on low – medium heat, add urad dal. Fry for few seconds, add broken red chiles and stir continuously. Once red chiles change color, remove from heat and add sesame seeds. Once the mixture cools down, grind it into fine powder using a spice blender. Heat a tsp of oil in same pan, add squeezed bitter gourd and fry till it turns light brown around the edges. Remove the bitter gourd onto a bowl. For tempering, heat a tsp of oil in a pan, add all talimpu ingredients in order. When urad dal changes color, remove from heat and reserve for later use. Heat remaining oil in the same pan, add chopped onion and fry till it turns translucent. Stir in chopped tomato, tamarind, jaggery, green chiles, turmeric, red chile powder, salt and cook till tomato is mushy. Grind the mixture into fine paste along with powdered spices. Remove the ground mixture onto a big bowl. Stir in fried bitter gourd, cilantro and the tempering. Serve bitter gourd chutney with steamed rice or with dosa etc..
Notes: Make sure to remove most of the bitterness from the bitter gourd. Suggestions: If the bitter gourd chutney is too bitter, add more tamarind pulp and jaggery to cut down some of the bitterness. Variations: You can also boil the grated bitter gourd with a tbsp of yogurt and few pinches of salt before frying it to remove most of the bitterness. Other Names: Bitter Gourd Chutney, Kakarakaya Pachadi, Karela Chutney. 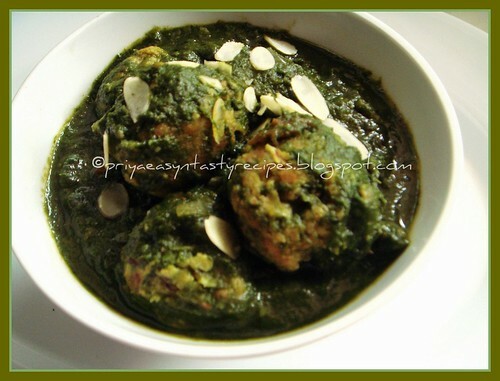 Mom makes similar chutney with cilantro/coriander leaves. This chutney has to be ground with minimum water so it just stays in its place when served. 1. Grind all the above ingredients without adding any water. 1. You can use cilantro and mint instead of just mint. 2. I like generous amount of mint in this chutney. If you want, you can reduce the amount of mint. Its kinda hot here and we are getting hooked to fresh juices and summer fruits like watermelon, peach and strawberries, after having those sweet watermelon chunks before throwing the green part, i removed that white part of the watermelon for making out some dals with those white part..While making out our usual cucumber raita i tried adding some grated watermelon along with cucumber and the crunchy texture of this watermelon tasted very fabulous and both cucumber and watermelon works out wonder together and we loved it, enjoyed having this creamy watermelon and cucumber raita with Chettinad Mutton Biryani..Easy breezy and refreshing raita get ready within few minutes and goes awesome even with rotis..To grate the white part of the watermelon will be bit tricky but this raita will tastes super delicious..
Take the grated watermelon, grated cucumer, thick yogurt, chopped coriander leaves,thick yogurt , mix everything well and let them sit in fridge.. While serving add enough salt and serve along with pulaos or briyanis..
Peel and chop the yam as large pieces, cook in water along with turmeric powder until the yam pieces gets slightly cooked, drain the excess of water and let them get cooled..
Now chop the cooked yam pieces as small cubes..heat enough oil, let splutters the mustard seeds & urad dal along with curry leaves, add immediately the chopped yam cubes along with red chilly powder,salt, coriander powder and salt, cook everything in simmer until the yam pieces get well mixed, close the pan with a lid and cook in simmer until the oil gets separates, finally add the pepper powder, toss everything gently and put off the stove.. Enjoy this peppered spicy yam stir fry with curd or rasam rice..
Mint cilantro rice is prepared by frying the mint and cilantro leaves and grinding them into fine paste with spices. The paste is then cooked briefly with garbanzo and mixed with steamed rice. Serve mint cilantro rice with raita of your choice. Makes: around 3 Servings of Mint Cilantro Rice. Wash rice and soak in fresh water for half an hour. Cook the rice with 2 1/2 cups of water till rice is soft and all the water has been absorbed. Soak tamarind in few tablespoons of water for some time and extract all the pulp. Clean, wash and roughly chop mint leaves, cilantro leaves and curry leaves. Heat a tsp of oil in a pan, add cashews and fry them till they turn light golden brown. Remove cashews and add all the chopped leaves to the remaining oil and fry till they wilt. Remove from heat and cool the leaves to room temperature. Grind the fried leaves with coconut, tamarind pulp, half of the cashews, half of cumin seeds, jaggery (if using), green chiles and salt into smooth paste adding sufficient water. Heat remaining oil in a pan, add remaining cumin seeds, turmeric powder and asafoetida. Fry briefly, stir in chana, cashews and salt. Fry the chana for few seconds, stir in ground mint paste. Add few tbsps of water if necessary and cook on low for 2 – 4 minutes. Remove from heat and stir in steamed basmati rice. Thoroughly mix everything and serve mint cilantro rice with tomato raita or boondi raita. Notes: Make sure not to overcook once the paste is added to the oil. 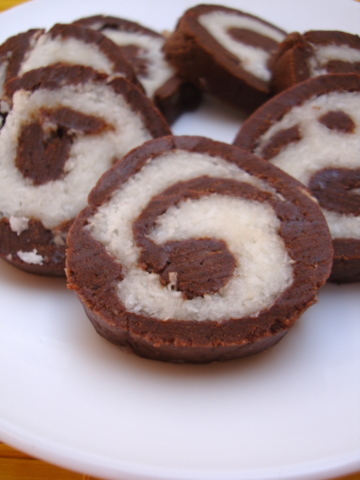 Suggestions: If the paste is overcooked, the coconut might turn strong and the leaves lose the aroma. Adjust the spice with green chiles. Add more jaggery or tamarind according to preference. Variations: You can also check the variation of rice here. Other Names: Mint Cilantro Rice. This is a quick curry for pav instead of making bhaji which takes a long time. Here couple of vegetables are chopped up finely and cooked till soft. A freshly ground masala powder is added for taste. The curry is sandwiched between two slices of pav bread and served immediately. Makes: around 2 Servings of Quick Pav Curry. Remove stem, discard seeds and finely chop the bell pepper. Wash, remove stems and finely chop the cilantro leaves. Grind red chile, coriander seeds, clove and cinnamon into fine powder using spice blender. Heat oil in a pan, add cumin seeds and caraway seeds. Then stir in chopped onion and cook till onion turns translucent. Then add chopped bell pepper and cook till bell pepper turns just soft. Now add ginger garlic paste, ground masala powder and fry for few seconds. Finally add tomato, peas and fry till tomato breaks a little. Add red chilli powder, and salt. Stir in lemon juice, cilantro and remove from heat. Slice the pav into two. Apply butter to both slices and place them on hot flat pan. Toast the sliced pav on both sides till they turn light golden brown in color. Serve the toasted pav with quick bhaji. Notes: Make sure to cook the vegetables right. Suggestions: If the curry is too moist, cook for some more time to remove any excesss moisture. Variations: For more spice, add few pinches of garam masala or red chile powder and cook for another minute. Other Names: Quick Pav Curry. Even deep fried dishes arent that much healthy, sometimes we cant say no to those deep fried beauties, here is one among those beautiful and nutritious pakodas with ragi flour and spring onions..When i was kid, my grandma used to make out these crispy pakodas with ragi flour for our snacks during our summer vacation, we enjoy these crispy pakodas whenever my grandma prepare, none will beat her way of making out this crispy pakodas that much perfect, these pakodas brings me loads of cherishable moments..I prepared this pakodas as the same way my grandma used to prepare but with my personal touch, yeah i have added a cup of spring onions to make them more tasty and we enjoyed having these crispies for our snacks, healthy ragi pakodas goes directly to Healing Foods-Onions guest hosted by me, event by Siri.. Mix together the ragi flour, chopped spring onions, chopped green chillies, crushed garlic,curry leaves, crushed fennel seeds and salt together, springle some water and mix everything well (take care not to turn the dough too watery)..Heat the oil for deep frying, springle the ragi-spring onions mixture little by little to the hot oil, fry until they turns crispy..Drain the excess of water with a paper towel..
Store in an air tightened box and enjoy for snacks..
to nagababu.gade@yahoo.co.in before June 30th 2010, midnight.